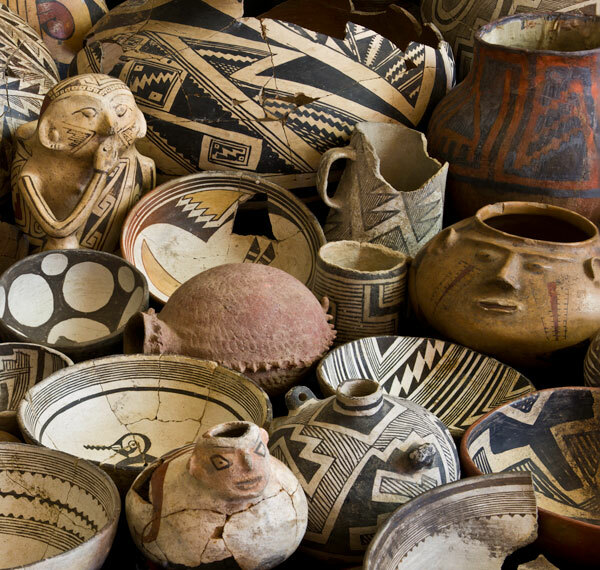 Whether you're aching to set your eyes on ancient pottery, walk under sweet smelling pines in the Gila, or take a glorious scenic drive - there's something for you. It's time to make some memories! ​The drive from Silver City to the Catwalk is a scenic trip. Highway 180 curves and rolls along the foothills of the Mogollon Mountains, a sky bound fortress of peaks cut by deep, craggy canyons. Whitewater Canyon is one of them. In the village of Glenwood you turn off the highway and five miles up the valley the road ends where the Catwalk narrows begin. There’s a beautiful National Forest picnic area shaded by giant Sycamore trees along the banks of Whitewater Creek and educational signage about the history and geology. 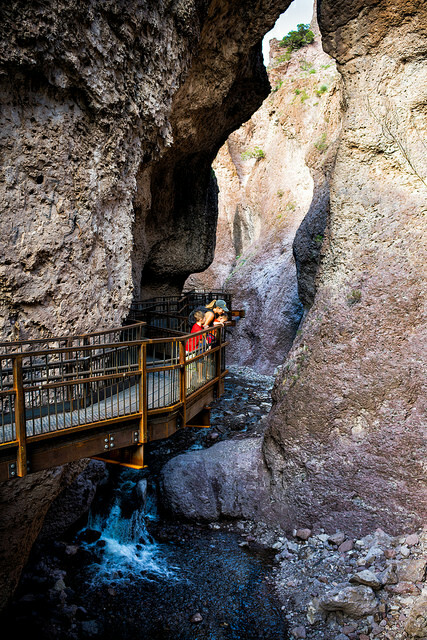 The first section of the Catwalk National Recreation Area through the narrows is universal and can accommodate people of varying abilities. The Catwalk National Recreation Area is a passage to hidden, secret places. Sheer cliff walls rise out of the streambed and the walkways, that are supported on steel beams 20 feet above the stream, and zigzag from cliff to cliff as they wind through the canyon. From the bridge the trail continues up Whitewater Canyon. It’s worth going about 100 feet further to an overlook above the bridge to get a view of the canyon. If you want to hike further continue on up the canyon and you’ll be rewarded by the beauty of Whitewater Creek and spectacular rock formations. The Catwalk National Recreation Area is a relaxing and rewarding way to spend the day enjoying a natural wonder and making memories. Take lots of pictures. Formed of volcanic ash welded together 35 million years ago, then sculpted by wind and water into rows of monolithic blocks, these incredible rock formations give City of Rocks its name. Hiking trails, a botanical garden and a public night sky observatory add to this unique destination.A Rocky Vacation: Rock formations like those at the City of Rocks State Park exist in only six other places in the world. Imaginative visitors may see the rock formations as a small city with houses, chimneys, courtyards and streets. Visitors can choose from 62 campsites scattered among the rocks, from which they can hike, bird watch, picnic, bike, take in the interpretive exhibits at the visitor center, explore the park’s botanical garden or star gaze. 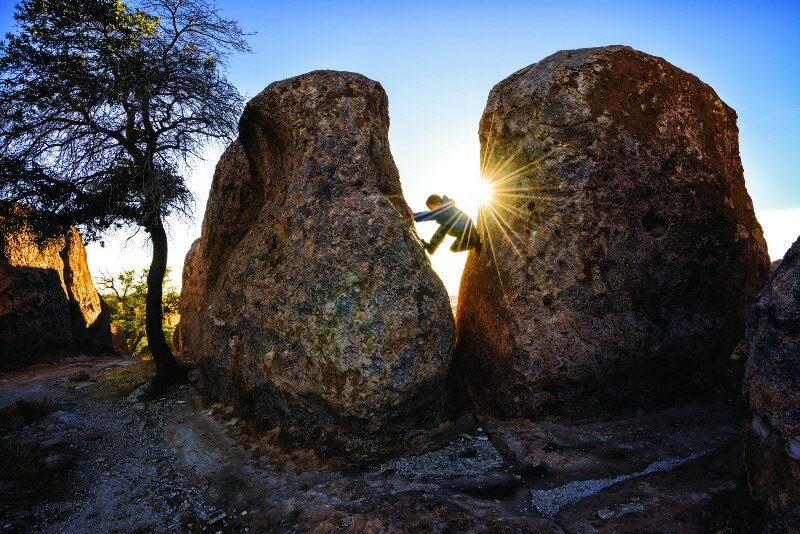 Life on the Rocks: City of Rocks State Park lies in the Mimbres Valley of the Chihuahuan desert. The park and surrounding grassland support yucca, agave, cacti and ocotillo, while growing among the rocks are Emory and gray oak. Mule deer, roadrunners, javelinas, cactus wrens, western diamondback rattlesnakes, ground squirrels, coyotes and jackrabbits all make their home here. History on the Rocks: Until 1200 A.D., Mimbres Indians roamed this area, leaving arrowheads and pottery shards as evidence of their culture. The park also lies within the traditional homelands of the Chiricahua and Warm Springs Apache. Spanish explorers and settlers arrived in 1500 and mule trains loaded with copper from the nearby Santa Rita mine passed nearby on their way to Chihuahua from 1804 to 1834. After the Mexican War of 1846-48, the Mormon Battalion blazed a trail south of the park to link newly acquired New Mexico and Arizona with the eastern United States. First Astronomical Observatory: Southern New Mexico is famous for its clear night skies and New Mexico State Parks established its first astronomical observatory at City of Rocks State Park. The observatory is a 12’ x 16’ building with a roll-off roof and is equipped with a 14″ Meade LX-200 telescope. The entire facility is solar-powered and includes a 20-inch monitor, which enables visitors to view images of the planets, stars and constellations transmitted through the telescope. Getting There: To get to City of Rocks State Park from Deming, take US 180 northwest 24 miles; then go northeast on NM 61 for 4 miles to the park entrance road. Includes: 52 sites‚ 10 w/ electric‚ restrooms‚ showers. The Continental Divide Trail (CDT), a national scenic trail, is known for the more than 3000 miles it covers from Montana’s Canadian border to Old West Country’s New Mexico border with Mexico. You’ll have the opportunity to hike about 350 miles from north of Pie Town (west of Socorro in the Cibola Mountains) to the Mexico border near the international port of entry at Antelope Wells, where the trail crosses the grayish limestone outcrops of the Big Hatchet Mountains. In Old West Country, the Continental Divide Trail tries to follow the actual Continental Divide. But here and there it will divert to bypass private land or to follow a more accessible trail. It passes through the rugged, forested mountains of the Gila National Forest, and one of our country’s most spectacular Wilderness Areas, the Aldo Leopold, the first area designated as wilderness by Congress. One of the highest peaks on the Trail is Pelona Peak at 9,220 feet. 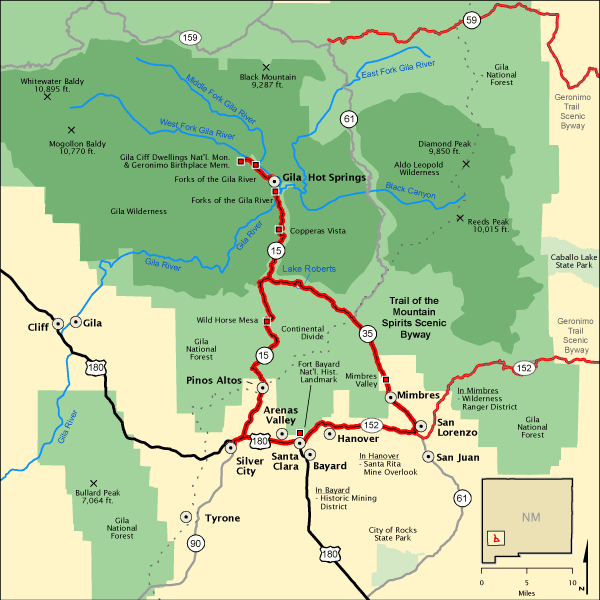 Through the Gila National Forest and the Apache National Forest some of the landmarks traversed are Elk Mountain, John Kerr Peak, Coyote Peak, and Wahoo Canyon in the Black Range. Silver City and Pinos Altos straddle the Continental Divide at 6000-7500 feet, providing surprisingly cool summers in the Southwest, as well as uninterrupted views of the Mexican border to the south. The Divide follows that ridge from which water flows either west to the Pacific or east to the Atlantic. You will cross the Divide many times as you travel through the Trail of the Mountain Spirits Scenic Byway in Old West Country. Fort Bayard played an integral role in protecting settlers and miners in the Los Pinos and Silver City mining districts. Copper, silver, and gold mining spurred economic development of this region of southwestern New Mexico. Soldiers from the fort battled many of the most famous Apache war leaders, including Victorio, Nana, and Geronimo. The first all-black regular army units made up of enlisted personnel, referred to as Buffalo soldiers, were organized in 1866 in the close of the Civil War. 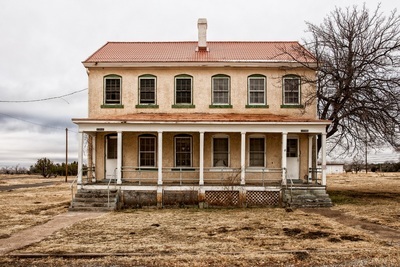 Fort Bayard was home to hundreds of Buffalo soldiers, who fought Apaches with distinction and who participated in the chase for Geronimo. His capture by Brig. Gen. Nelson A. Miles in 1886 effectively ended the Apache wars. 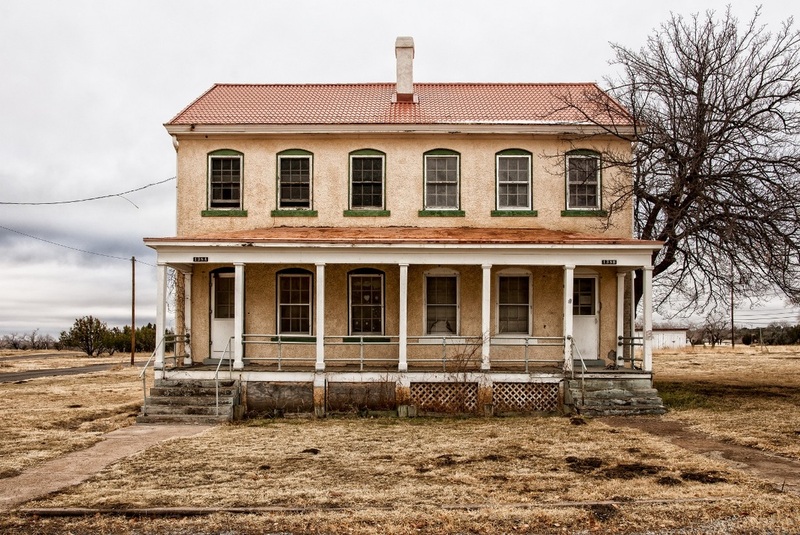 An unusual sequence of events has helped preserve the integrity of Fort Bayard. 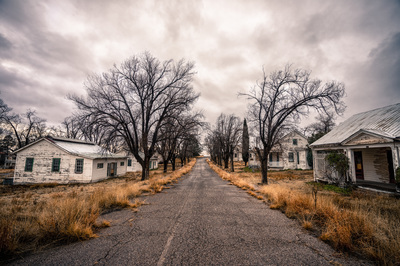 The post buildings were transferred to the Surgeon General of the Army, then the Veteran’s Administration, and finally to the State of New Mexico as a hospital. Its layout and many of the buildings date to the late 19th century and offer the visitor a rare opportunity to see a military fort as it would have appeared in the 1800’s. Today, the fort maintains many historic buildings and monuments, including the life-sized monument to the Buffalo Soldiers stationed here. Take a self-guided tour year round, or a guided tour on Saturdays during the Spring to Fall months. Fort Bayard also hosts an annual historic re-enactment of fort life in the 1800’s during the annual Fort Bayard Days. 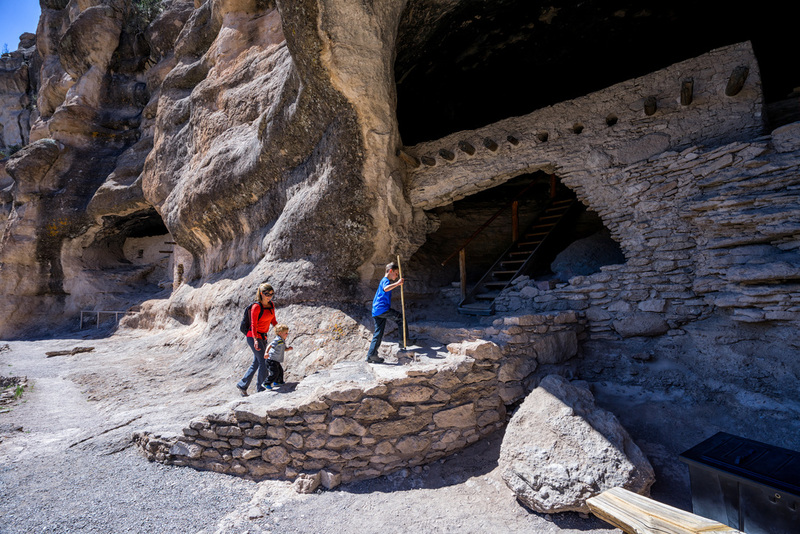 The Gila Cliff Dwellings National Monument offers a glimpse of the homes and lives of the people of the Mogollon culture who lived there from the 1280’s through the early 1300’s. Containing 533 acres, the monument was established on November 16, 1907. The dwellings are located forty-four miles north of Silver City, New Mexico, on Highway 15. 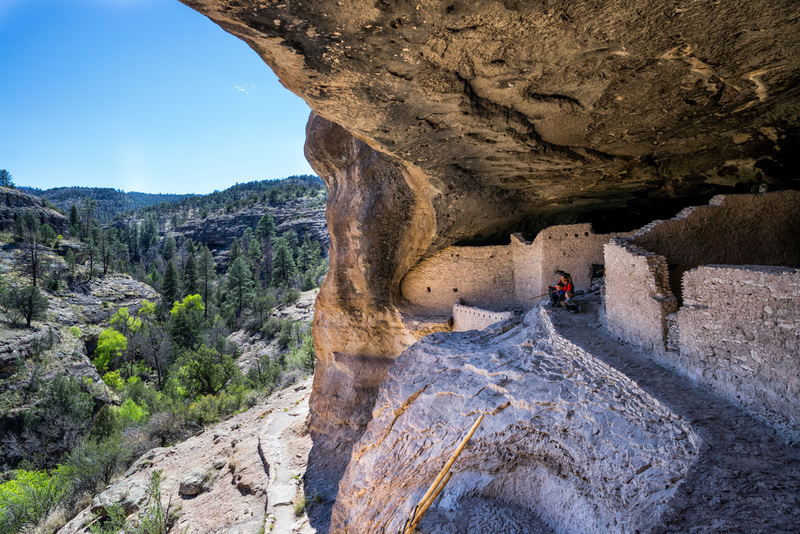 Surrounded by the Gila National Forest, the Gila Cliff Dwellings National Monument lies at the edge of the Gila Wilderness, the nation’s first designated wilderness area. This unique area in southwestern New Mexico offers a glimpse of the homes and lives of Indians who lived here from the 100’s to 1300. Settlers in the early 1870’s penetrated the area in search of water and fertile land on which to homestead. They were surprised to find traces of an earlier race of men, who in the dim past had lived, loved and farmed the narrow valleys. Fallen walls of stone, strewn with pottery fragments, clearly indicated a people of high culture who made their homes there. The cliff dwellings were built in the 1280’s. 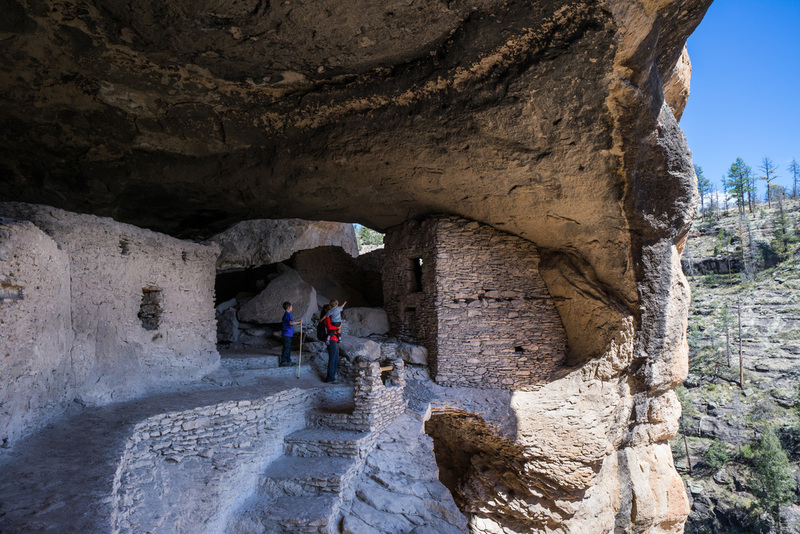 These Pueblo people built their homes in natural caves and in the open. There are examples of both types of settlements in the monument area. Probably not more than 8 or 10 families lived in the cliff dwellings at any one time. The rooms were probably not used for more than one generation. These small, diligent, artistic people lived in cliff houses and riverside villages, tilling mesa top and riverside fields with digging sticks, grinding cornmeal with metates and manos, fashioning pottery and cloth, carrying on trade with Indians of other communities, hunting, and gathering wild plants and fruit to supplement their squash, corn, and beans. They were skilled potters, producing handsome brown bowls with black interiors and black-on-white vessels. Seven natural caves occur high in the southeast-facing cliff on a side canyon, and five of the caves contain the ruins of cliff dwellings– 42 rooms. Walls of the buildings were constructed of stone. All the timbers seen in the dwellings are the originals. Tree-ring dates obtained from these timbers range through the 1280’s. The cliff dwellers had abandoned their homes and fields by 1300. Why they left and where they went are not known. Perhaps they joined other Pueblo Indians to the north or south. Mild climate, with rainy season July to August, usually in the afternoons. Spring and Fall have moderate days and cool nights. Winter months often have nice afternoons with cold mornings and nights. Gila Cliff Dwellings entrance: $3.00 per person for ages 16 and older. Museum, visitor center and contact station located at the monument. Adjacent Gila Wilderness and Gila National Forest have over 1,490 miles of wilderness hiking and riding trails. 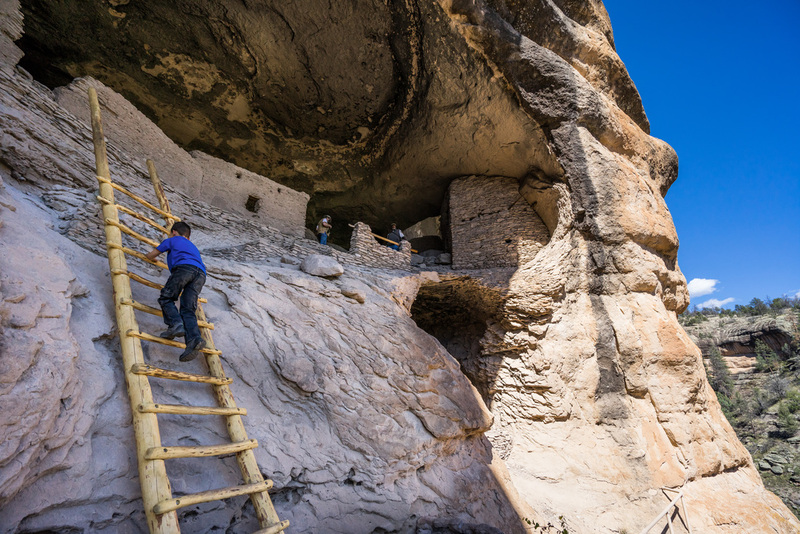 Daily tours of the cliff dwellings will be held at 11 am from July 1 through September 1. It is a half mile walk from the parking area to the beginning of the guided tour, so visitors should allow extra time for that. From the cottonwoods of the Mimbres Valley, you will quickly enter the juniper, pinon and ponderosa pine country of the Gila (pronounced ‘HEE-la’) National Forest. Here, spruce and fir thrive on the highest peaks, while the desert agave clings to the vertical cliffs of deep canyon walls. Almost one fourth of the 3.3 million acre Gila National Forest are designated as wilderness areas. Largest of these is the 438,360 acre Gila Wilderness, promoted by conservationist Aldo Leopold and set aside in 1924 as the first such area in the United States. Some 400 miles of fishing streams lace the entire forest. Wildlife in the Gila National Forest includes Rocky Mountain mule deer, Sonoran White-tail deer, beaver, elk, bobcat, mountain lion and black bear. The lucky person may spot wild turkey, antelope and other animals in the right season. Largest federal land mass encompassing more than any other forest area except Alaska: The Continental Divide meanders through the Gila for 170 miles of solitude and grandeur. The Gila National Forest lies from Silver City north to Reserve and west from Hillsboro to the Arizona border. New Mexico’s Most Remote Spot: On December 6, 2001, the Albuquerque Journal named a location in the Gila Wilderness as “New Mexico’s Most Remote Spot.” A team examined the point most distant to roads and to population density. They chose a point 11.5 miles west of the Gila Cliff Dwellings Visitors Center. The first wilderness set aside by Congress was the Gila Wilderness, found within the vast 3.3 million acre Gila National Forest. The Gila Wilderness is the largest with 559,324-acres and is one of four designated wilderness areas within Old West Country … three within the Gila National Forest (Gila, Aldo Leopold and Blue Range Wilderness) and one within the Cibola National Forest (Apache Kid Wilderness). Popular theory says that the word Gila was derived from a Spanish contraction of Hah-quah-sa-eel, a Yuma Indian word meaning “running water which is salty”. 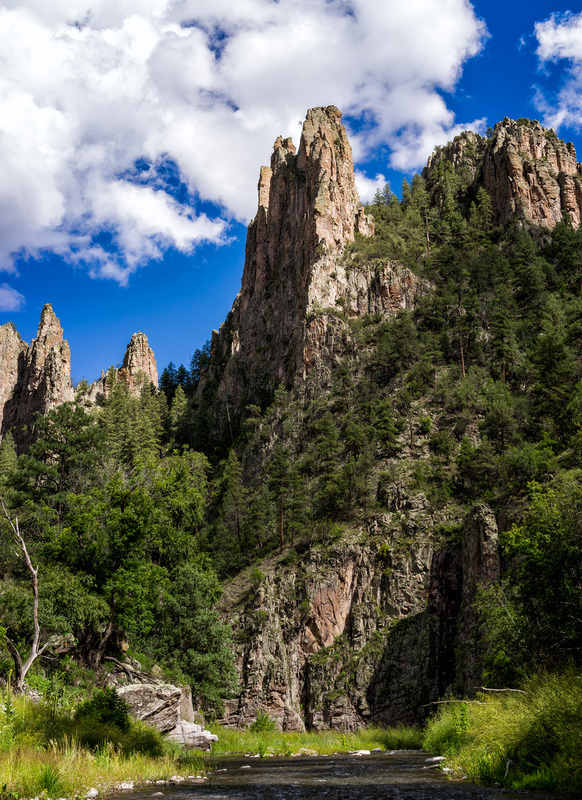 The naming of the Gila National Forest is indicative of its interesting history and beauty. The Forest, tucked away in southwestern New Mexico, is a paradise for those seeking solitude and escape from modern society’s busy lifestyle. Every National Forest offers its own unique beauty. The Gila’s beauty is in its diversity of rugged mountains, deep canyons, meadows, and semi-desert country. Elevations range from 4,200 to 10,900 feet and cover four of the six life zones. Flora and fauna are diverse. Ocotillo and cactus are found in the lower elevations, and juniper, pine, aspen, and spruce-fir forests are plentiful in the high mountains. Wildlife such as the black bear, mountain lion, elk, deer, antelope, bighorn sheep, and wild turkey inhabit the Forest while the bald eagle, peregrine falcon, and the red-tailed hawk soar in the wind. The Gila National Forest is big: It includes more than 500,000 acres of rugged land, dominates the landscape of our county and extends west all the way to the border with Arizona. Hundreds of recreational activities and popular spots exist within the forest. To get your bearings, spend a few minutes with the rangers in each of the ranger districts. 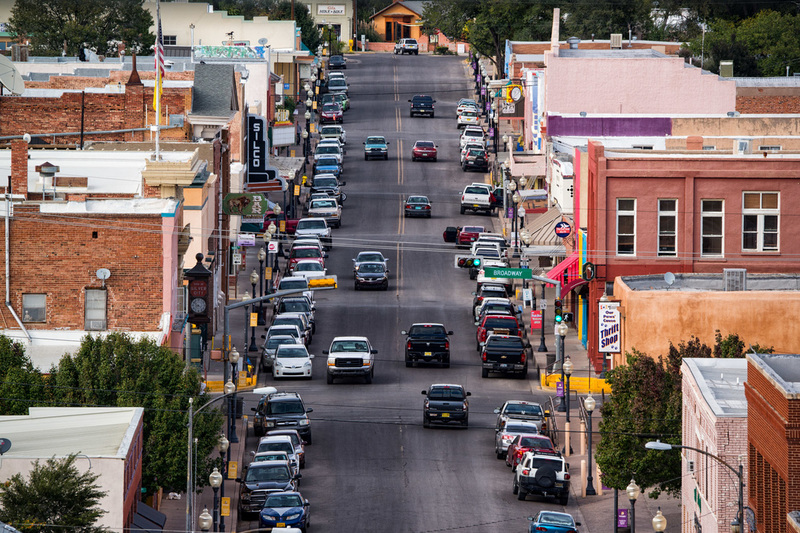 Historic Downtown Silver City is a hub of art, culture, eateries, and events. 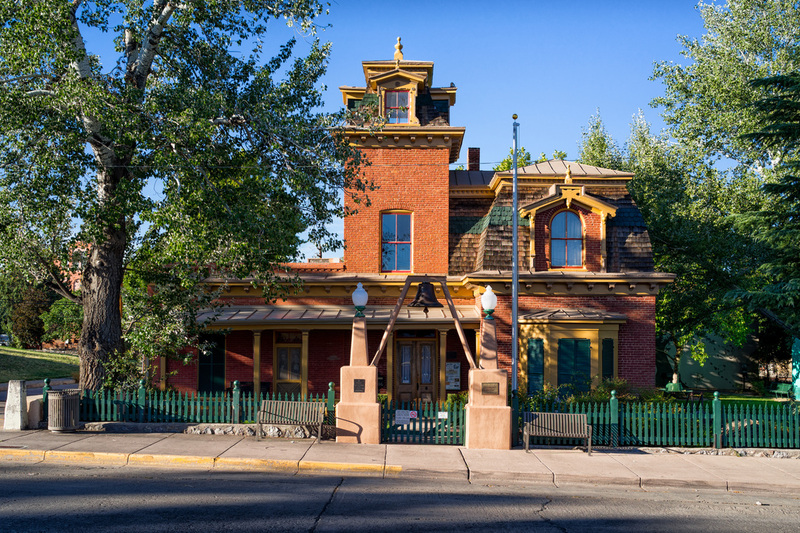 The district balances historic era frontier buildings, while also engaging in more contemporary and colorful art forms. The town boasts three historic residential districts immediately adjacent to the historic downtown district. Downtown, you'll find many of our murals, retail shops, galleries, studios, theaters, and restaurants. In addition, the Historic District includes the “Big Ditch” now a popular downtown park and one of the entrances to Silver City’s many greenways. 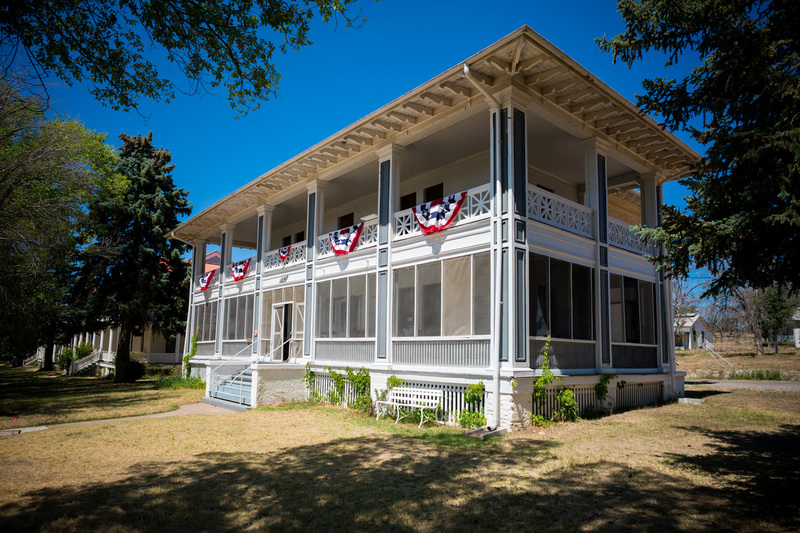 Start your visit at the Murray Ryan Visitor Center, 201 N. Hudson Street, and you’ll soon see that there is so much to see and do in Silver City that you may want to stay an extra day! The Central Mining District is a 45 square mile area in Grant County NM and includes the population centers of Bayard, Hurley and Santa Rita. The district also includes one of the largest open pit mines in the world (at Santa Rita) and a large copper ore processing facility south of Hurley.Mining goes back a long, long way in Grant County. When the Spanish explorers first arrived to this area, the native Americans were already well established using copper from what is now the area of the Santa Rita mine. The Europeans brought in increasingly sophisticated technology, and over the years much of the development of Grant County was related to the successes and failures of local mining. Santa Clara, formerly called Central, is nine miles east of Silver City on US 180. The oldest village in the District, its history is closely tied to Fort Bayard. Soldiers from the fort would go to Santa Clara for recreational pursuits. At Santa Clara, NM 152 branches off US 180 and climbs north through four miles of lovely, thickly forested hills to its crossroads with NM 356 at Hanover. 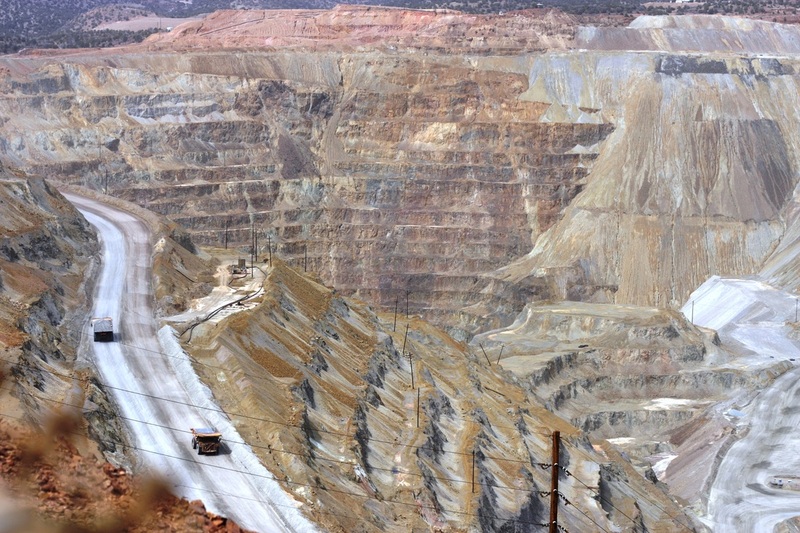 A mile from Hanover on NM 152, an overlook offers visitor a view of the enormous Santa Rita open pit copper mine–1500 ft. deep and 1.5 miles across! To the east is the Kneeling Nun, a geological formation which has served as a landmark through history. It holds special significance for many residents. Hurley, four miles south of Bayard off Hwy 180, was a true company town. The company (the Chino Mine branch of the Nevada Consolidated Copper Co., later Kennecott Copper Corporation) owned pretty much everything: schools, stores and homes. Central to the community was the old Hurley Company Store. Later, Phelps Dodge operated a smelter and converter right near the center of town. The two smokestacks were visible for miles. The stacks were taken down in 2007. Today, copper mining operations in the area are owned and managed by Freeport-McMoRan. Rather than using a smelter, copper ore is now processed a few miles south of Hurley using a process called electro-winning. An interesting stop for visitors is the former Hurley Company Store which has been restored. Opened in 1967, the museum is a department of the Town of Silver City with support from the Silver City Museum Society and The Institute of Museum and Library Services. Housed in the restored 1881 Mansard/Italianate H.B Ailman House, the museum collection resource materials include some 20,000 objects relating to the peoples and history of southwest New Mexico. A twelve-member Board of Directors, appointed by Silver City’s mayor, oversees strategic planning and policy for the museum. Museum operations are administered by our small Museum Staff, supplemented with a large corps of volunteers. TIME TO ALLOW: Take three hours to drive, or six-eight hours to experience this byway. FEES: There are no fees to drive the byway. Western New Mexico University Museum is undergoing a $3.2 million transformation of its official home, historic Fleming Hall. While WNMU Museum in Fleming Hall is closed to the public for the duration of the transformation (reopening TBD), which will include the installation of heating, ventilation, air-conditioning, and fire suppression systems, Watts Hall is the temporary home of the museum. Located at 500 E. 18th Street in Silver City at the corner of Silver Heights Boulevard and Swan Street (across from CVS Pharmacy), Western New Mexico Museum in Watts Hall contains a temporary display of some of the most intriguing prehistoric Mimbres pottery from the museum’s NAN Ranch and Eisele Collections, and the Museum Shop on the Lower Level. When available, architectural renderings of the transformed Fleming Hall interior will be displayed in the Lower Level lobby. WNMU Museum in Watts Hall is open Monday-Friday from 10:00 am to 4:00 pm, and closed weekends and holidays. Admission is free, and Watts Hall is handicap accessible. As Fleming Hall undergoes renovation so will WNMU Museum’s website, www.wnmumuseum.org. For more information about WNMU Museum in Fleming Hall, including hours and directions, please contact us at (575) 538-6386. As a reminder to tour directors and researchers, WNMU Museum’s collections are closed to research, loans, and tours for the duration of Fleming Hall’s transformation.